Parents urged the school board to consider postponing a Calabro-Brandt merger. 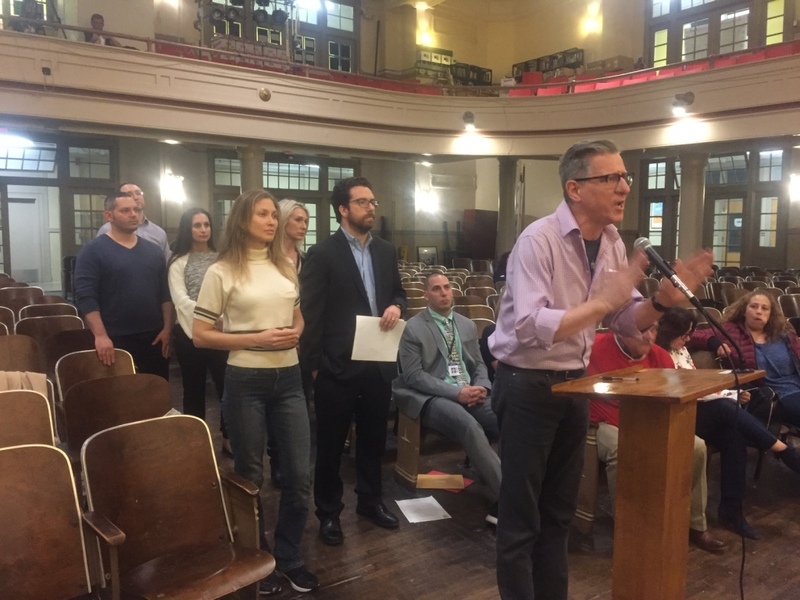 Last week parents urged the Hoboken Board of Education to carefully consider all options before deciding whether to merge Calabro and Brandt elementary schools. The decision to possibly merge the two schools stems from increasing enrollment and a reduction in state aid. A merger would help provide more classroom space and address the district’s funding shortfall in the 2019-2020 budget. Hoboken lost $527,524 in state aid this year and is projected to lose an additional $450,418 in state aid next year. The district also has to plan for contractual salary increases, a 9 percent health insurance increase for all staff members, and restrictions on the tax levy cap. Charter school tuition, meanwhile, will increase from $10,100,707 last year to $10,385,484 in 2019-2020. The district faces increased enrollment of approximately 15 percent for kindergarten through 12th grade, from 2,812 to 3,195 and must provide seven additional classes of free Pre-K this year. This means next year the district will provide 66 classes of state-mandated free Pre-K for a total of 990 students. To address these issues the board is considering merging Calabro and Brandt elementary schools and repurposing the Calabro building as an early education center for the 2019-2020 school year. Although the board did not discuss or vote on the possible merger at its regularly scheduled monthly meeting on Tuesday, April 9, 12 concerned parents addressed the school board trustees during public comments asking them to look for other ways to save money or to postpone the decision until the following year. The parents had been notified of the merger during a Calabro Elementary School Parent Teacher Organization meeting only the week before. Several speakers said they felt the district had not been transparent with Calabro parents and that they were not given enough time to digest the possible merge. Joseph Gallo, a 30-year resident, said the timing of the announcement of a possible merger made it difficult for parents who were now unable to make a choice regarding their children’s schooling because charter school lotteries have already occurred for the next school year. Gallo also noted that Calabro is the district’s top performing elementary school. By closing it, he said, the district is perpetuating the negative stereotype of being a bad school district. Several parents noted that over the years many families left the district because of this negative stereotype and that the ones who stayed have found a home at Calabro and formed a family. She noted that since Calabro parents were informed of the possible merger at a Parent Teacher Organization meeting just two weeks ago, some are already looking to move to the suburbs, or at private schools. “I don’t want to leave, and I feel like we are being wrongfully evicted,” she said. Another parent and lifelong resident, Alex Garcia, said his children thrive at Calabro in part due to the small class sizes which won’t be the case at Brandt. “You guys are affecting my kids at this point … my family,” he said. “By making these changes you’re pushing us away. He’s considering alternative schools for his children despite the fact that he was a Redwing. One mother noted that her son moved to Calabro just two years ago and has finally adjusted and now he will have to go through the “stressful” adjustment to a new school again if the board decides to merge the two schools. For more on the possible merger see “Calabro conundrum” at hudsonreporter.com.